Episode Six - Oh. Am I Old? Maya is joined by model Charlotte De Carle, chef and author Jasmine Hemsley and Refinery 29’s Sarah Raphael to answer the important questions about ageing… How old is old? Is 40 the new 30? Will I still be on Insta when I’m 80? 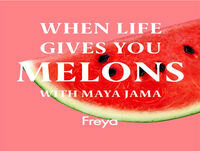 All is revealed in episode six of ‘When Life Gives You Melons’.